Catch some joy wth Cadbury! 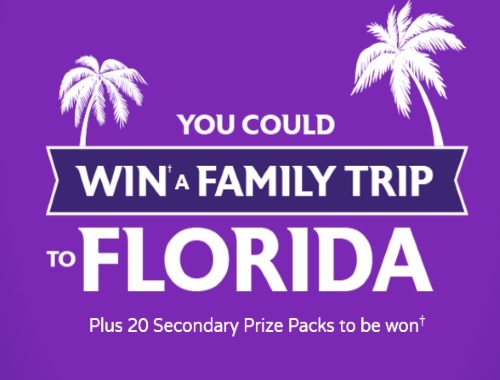 Enter for your chance to win a family trip to Florida plus 20 secondary prize packs to be won! One grand prize: family experience with trip to Florida for four during March 2018. Grand prize ARV: $7,800 CDN. Twenty secondary prizes: Cadbury/Trident products, one Toronto Blue Jays replica baseball cap, and one Toronto Blue Jays-branded t-shirt. Secondary prize ARV: $100. Limit 1 entry per person/day. Limit 1 Grand Prize and 1 Secondary Prize per person/household. Contest closes October 2, 2017.